Wind project developer NaturEner respected nature when it decided to redesign the eastern phase of its 189 MW Rim Rock wind farm in northwestern Montana to relocate 25 turbines because of their proximity to historic raptor nests. Listen to Greg Copeland, project manager for NaturEner USA, discuss the Rim Rock Wind Farm near Kevin, Montana, and you quickly learn of the myriad complexities involved with building the 189-megawatt wind power project. "It's not our first rodeo, but it's also not something for the faint of heart," said Copeland, who is based in Calgary, Alberta, Canada. "There were a lot of moving pieces on the board that had to be aligned properly. There were a lot of barriers that we had to overcome on the fly. But that's what we are—problem solvers—and we met the challenges." NaturEner had to overcome hurdles inherent to most wind projects, such as transporting components up to 38.5 meters long through rural towns en route to the site. But the project also faced obstacles created by unique financing partnerships and the relocation of 25 turbines midway through construction to help protect historic birds of prey nesting areas. NaturEner USA—the North American subsidiary of Madrid, Spain-based parent company, Grupo NaturEner S.A.— acquired Glacier Wind Farms 1 and 2 and their sister project 25 miles to the north, the Rim Rock Wind Farm, in 2006 from Great Plains Wind & Energy LLC. Glacier Wind Farms 1 and 2 were further along than Rim Rock, with the 106.5 MW first phase coming online in 2008, followed by the 103.5 MW second phase in 2009.Montana doesn't have the heavy industry to consume the 400 MW total of wind energy that the three projects produce, so NaturEner explored other options. In the end, the firm reached an agreement with Toronto-based Tonbridge Inc., which is building the 214-mile-long, 600 MW Montana-Alberta Tie-Ltd. that links Great Falls, Montana, to Lethbridge, Alberta. Completed this summer, the system carries power from the Glacier Wind Farms 1 and 2 as well as the Rim Rock Wind Farm and feeds it into the Western Interconnection. Prior to its completion, the wind farms were restricted to operating at about 25 percent of rated capacity, Copeland said. That energy was fed through a temporary interconnection into the Northwest grid, which had enough capacity to absorb the smaller amount. 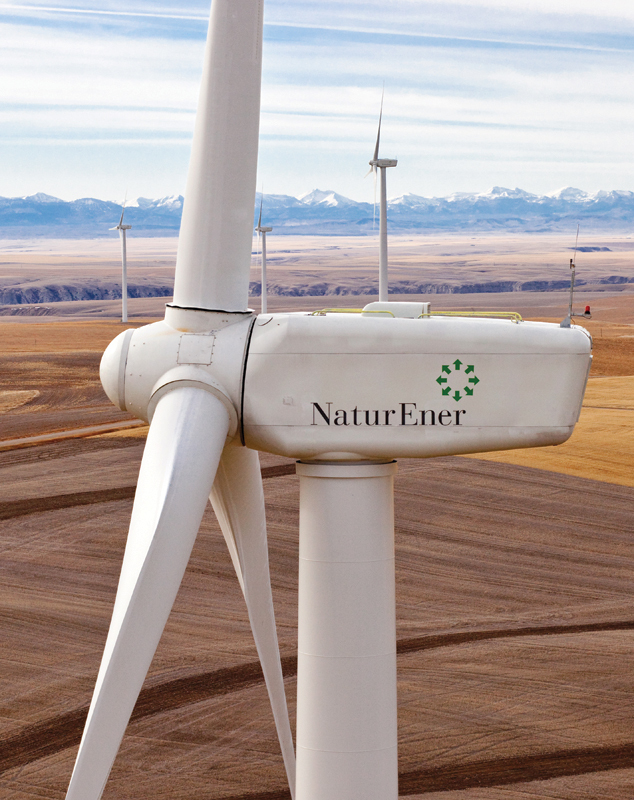 A cornerstone of both wind projects is NaturEner's unique Wind Watch Balancing Authority, based at its headquarters in San Francisco. Drawing from in-house experts, wind stations, and proprietary software, the system can predict changes in weather conditions and wind production two hours into the future. "It's not a commitment for a certain amount of power we're going to provide, but we're able to forecast on an hourly basis what the production is going to be," Copeland said. They only have to firm up the power supply if they're off on forecasting, he added. When NaturEner acquired the projects, they were fairly far along in development. The company was able to put together an innovative financing package that included the public utility, San Diego Gas & Electric (SDG&E). The utility was able to purchase renewable energy credits from both Glacier wind farms, and later from Rim Rock, to satisfy renewable energy portfolio standards mandated by California. The California Public Utilities Commission approved the deals, even though the RECs were from projects outside of California. The PUC has since closed the door on similar arrangements with other out-of-state wind energy projects. The REC deal drove NaturEner and SDG&E to explore other ways the utility could participate in the wind projects as a pure equity partner. Although equity partners are common among private business, it's rare with a public utility. Acciona Windpower supplied 125 of its AW 77-1500 1.5 MW turbines for the Rim Rock project, which is located on 21,000 acres of private land in Toole and Glacier counties, on which NaturEner has a long term lease. "And the return on investment was pretty good for the utility," Copeland said. The proposal drew concerns from a couple of ratepayer advocacy groups, which challenged it, saying the deal was too risky for the utility. Things were settled after NaturEner proposed downsizing the project to the current 189 MW from the proposed 309 MW, he said. Even with the smaller size, he said the investment still benefited the utility. NaturEner also negotiated a long-term power purchase agreement with Morgan Stanley Capital Group. "It's not just bilateral, but trilateral complex agreements," Copeland said. "Morgan Stanley has the opportunity to move that power into or out of the Alberta market, but that's their responsibility as the off-taker." The project is on 21,000 acres of private land in Toole and Glacier counties on which NaturEner has a long-term lease. Because the project was on private land, the company did not need to draft an environmental impact statement. But news of the project caught the attention of the Helena-based Montana Audubon. "We'd heard rumors that a company was interested in that site, and the raptor densities are incredibly high," said Janet Ellis, program director. Montana Audubon had data on hundreds of historic raptor nests dating back to 1988 in the nearby Kevin Rim Important Bird Area. Of greatest concern were historic nesting sites for 10 different species of raptors, or birds of prey. Despite requests to move the turbines located closest to the nests, Ellis said the organization didn't get very far. But something changed in early 2012. "We met with Greg Copeland in January and were told that the design was set," Ellis said. "But within a month or six weeks, they had decided to move some of the turbines that were closest to the raptor nests." Copeland said after hearing of the Audubon group's concerns, he went back and, using software, began to plot what it would take to move the dozen turbines back a half mile from the historic nesting sites. The closest turbines originally were about a quarter mile from the historic sites. After a series of meetings with the NaturEner board, the Audubon board, and investment partners SDG&E and Morgan Stanley, Copeland said a consensus was reached. "If we could do it, and the cost (while not incidental) was something we could absorb, we should provide the desired half-mile locations for those turbines." Because the turbines are managed in sets, NaturEner couldn't just move the 12 that were within a half mile of the historic raptor nests. Instead, the company ended up redesigning the eastern phase, which involved 25 turbines. As a result, geotechnical surveys for those turbines had to be updated. The land involved was enrolled in the Conservation Reserve Program, which is designed to conserve soil on highly erodible lands. The company had to be off the CRP land by May 10 and finished the surveys on May 8, 2012. Geotechnical aspects weren't the only component that needed to be changed. "We also had to take into account all of the complex topography and complex archeological setbacks that had to be incorporated into the revised design," he said. "It took a lot of late nights and a lot of effort on the part of a lot of people to pull it off." NaturEner was able to move the turbines at least a half mile from all of the historic raptor nests, except for two. For those two, the setback was 0.48 miles. "We redesigned the project on the fly at a significant cost," Copeland said. Ellis said there are no long-term scientific studies on the effects of turbines on nearby raptor nesting and reproduction. As a result, she said she didn't know whether a half mile was sufficient. Nevertheless, she praised NaturEner for doing the right thing. "We didn't expect them to do that, and we were really grateful," she said. Montana Audubon and NaturEner have also drafted a memorandum of understanding that outlines how the two will continue to work together to monitor birds of prey in the area and share data. As with any large project, NaturEner issued a request for proposals. It came down to Minneapolis, Minnesota-based Mortenson Construction (which had built the two Glacier Wind Farms) and another firm. The financial proposals were so close that Copeland said NaturEner had to look at each company's safety record. Mortenson won out with a better safety rating. 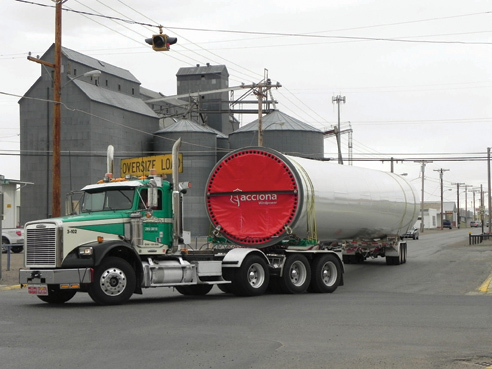 Acciona Windpower was also responsible for coordinating transportation from the manufacturing site in West Branch, Iowa, to the foundation base on site—not an easy task. Routes had to be mapped out to ensure the trucks and 60-foot-long trailers could make it around corners in rural towns along the way. "Ultimately, it turned out being a good thing because there were not that many change orders," he said of Mortenson. "But there were challenges that had to be overcome. They coordinated things that had to be dealt with, and they did what they said they were going to do with very few exceptions." Before the first turbine could be installed, the land had to be prepared and roads built to provide access to each pad. Altogether, 40 miles of roads were built, and 125 crane pads were installed. Acciona Windpower supplied 125 of its AW 77-1500 1.5 MW turbines, the same type that were used in the two Glacier wind farms. The firm was also responsible for coordinating transportation permitting and logistics from the manufacturing site in West Branch, Iowa, to the foundation base—not an easy task. Under the contract, Acciona was also responsible for commissioning and maintenance for seven years. Since the components were oversized, the routes first had to be mapped out to ensure the trucks and 60-foot-long trailers could make it around corners in rural towns along the way. In many towns, shoulders had to be widened to accommodate the oversized loads. "It's a challenge whenever you have oversized trucks," Copeland said. At the same time, tower components were trucked directly to the turbine sites, and other components were delivered by rail to a nearby lay-down site. Each turbine consisted of the nacelle, three blades that were each 38.5 meters long, and a 89-meter-tall tower built of rolled steel. The tower was actually built in three pieces that were assembled at the site. Each foundation consisted of 350 cubic yards of concrete. The three pieces of the tower were stacked one on top of another and secured. The nacelle was then lifted into place. 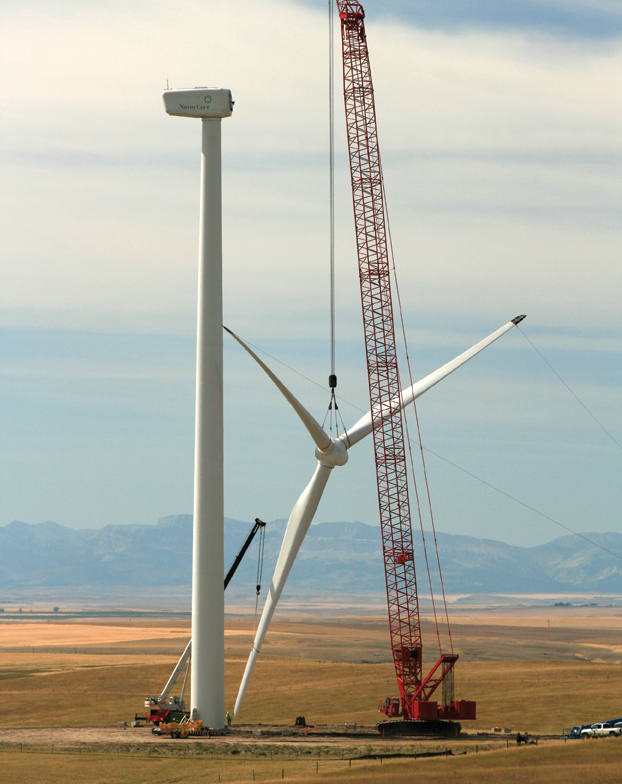 After the three blades were attached to the hub while it was still on the ground, the hub was lifted and attached to the turbine. "It's not incredibly complex," Copeland said. "The complexity is in working everything up and making sure everything is operational when you get it together." NaturEner was able to obtain certain property tax incentives by meeting prevailing wage criteria. The company tried to hire local, but it was also competing with oil and gas industry jobs in North Dakota and eastern Montana. "Certainly with the example of the turbines and the testing on the turbines, those workers would have been from outside the state," Copeland said. "But a lot of the basic construction would have been locals." The project also included two 230 kilovolt substations that step down the power from 240 to 115 watts before it is fed into the northwestern system. Initial project construction started in early January 2012, and the project entered testing in November the same year. Rim Rock began commercial operation December 31, 2012. NaturEner isn't stopping with the nearly 400 MW of wind production from its three recent projects. The company has embarked on the Red Creek Wind Farm (also in wind-rich Montana), which could produce up to 110 MW of additional wind power, depending on turbine alignment, Copeland said.